The application fields that utilize LiDAR data, possibly in combination with imagery, experienced a rapid growth within the last years. Terrasolid's software products can be used in any of these application fields, because they are neither fixed to specific applications nor to certain laser scanning or camera systems. The software can deal with data from airborne and mobile systems, and even data from static terrestrial scanners can be processed to a limited extend. Since the several products of the Terrasolid software family cover the whole production cycle from calibrating and matching raw data to the creation of final 3D vector models, ortho photos, terrain representations, etc., the software is highly flexible regarding different application fields. 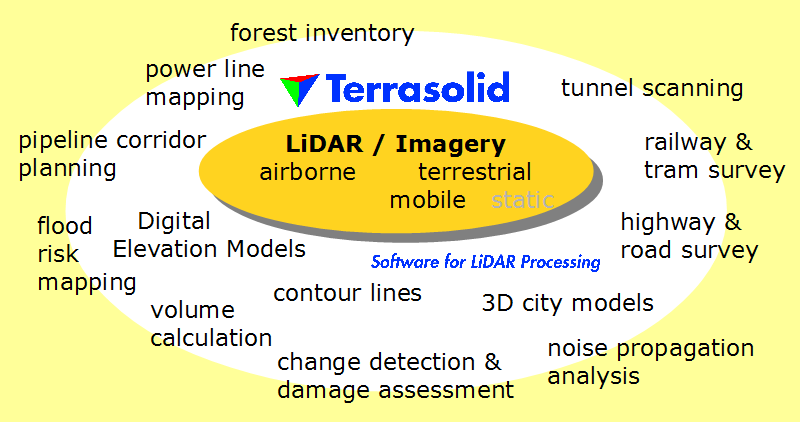 The pages linked in the list on the left give an overview of several typical application field examples and thus, of potential application areas for Terrasolid products for LiDAR and image processing. If available, the pages provide also information about case studies and links to articles, web pages or other sources for further reading.